My daughter can not understand why the fire was not put out by the overhead dry powder system which should have kicked in. Apparently there was a lot of wood in the structure of the elderly building which is why it burnt so easily. The up side means that relocating the Folkestone staff should help ease the pressure caused by lack of staff at the Dover store. kent onlines view of the story. Morrison's have announced that nobody will lose their job but the way I see it many staff will have to leave. Those with contracted hours moved to Dover could be happy if their hours were not spread over too much but those on zero hours will simply get that meaning that technically they are not being laid off. Howard, I doubt anyone will loose their jobs as they will go to Dover or Canterbury. Dover needs extra staff especially as they were already badly understaffed, I suspect Canterbury is in a similar position. What it might mean is the stores will probably not need the seasonal staff they would normally employ and I also doubt there will be any overtime for anyone. bit of an update here. 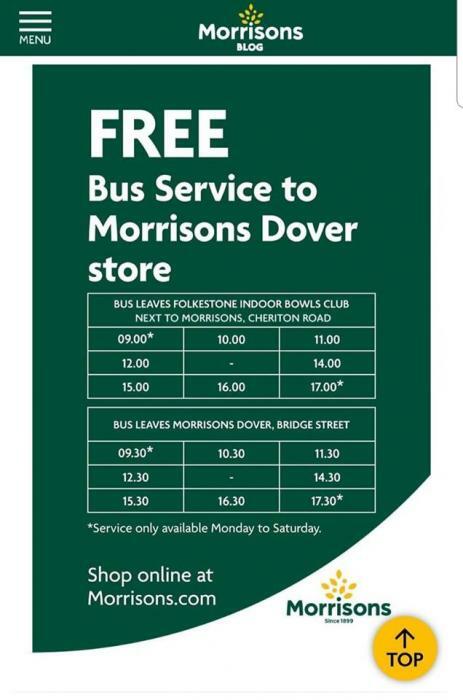 Nice offer but i can't see many people taking it up with Asda, Tesco and 2 branches of Sainsbury in Folkestone. Time spent on bus about an hour plus waiting time after shopping done of least half an hour. Dover's store was much busier than usual yesterday so it seems some prefer customer loyalty to a local location. I have checked and Morrisons do not use "zero hours" contracts, every employee has a contract with either set hours or flexible hours depending on what they choose, the very minimum being 8 hours.